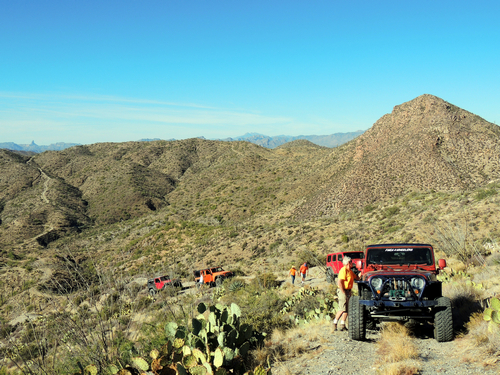 First To Find is a short, challenging and fun Jeep trail. It has not had maintenance forever, and there are many eroded areas that will test your tolerance for off camber situations. There are gullies running down the road, and MANY wash crossings with steep and tippy entrances and exits. GOOD ARTICULATION IS A MUST! The washout shown in the photo to the right is interesting if your vehicle does not have it. Warning: This trail has several dangerous locations with severe off camber. If this statement bothers you do not do the trail. Combine this fun trail with another in the area to make a full day. Someone hid a geocache at the end of a tippy spur off First to Find. There is a bit of honor in being the “First to Find” a geocache, so some people will go to great length to do it. The person that was the FTF rolled his vehicle and was injured quite badly. He had to be heilcoptered out and then had to hire a tow truck to get his vehicle out. He described his experience as “Most Expensive First to Find Ever”. The spur is very, very tippy and I do not recommend driving on it. It is NOT included in the track. FTF!! But, OH what a day it was. Started the drive in on Telegraph Canyon Rd, Then on to Ajax Mine Rd. The driving was fairly easy going in my Tacoma. Got to the Orphan Boy Mine Rd turn off to head South, and my conscience told me to stop there and hike the rest of the way. I've never been one to may much attention to that little voice in my head, so I drove in a ways. Not too bad. Found a spot to park, and walked the last 1/4 mile or so to the cache. Found the cache easily enough and signed the log. Took a few pictures, then headed back to the truck. This is where the day starts getting interesting. On the way out towards Ajax Mine Rd I got the left front tire caught in a runoff washout on the side of the road. As I was just getting the tire clear of that, I felt the left rear go over the edge. After that, it was gravity that took over, and I couldn't do anything about it. 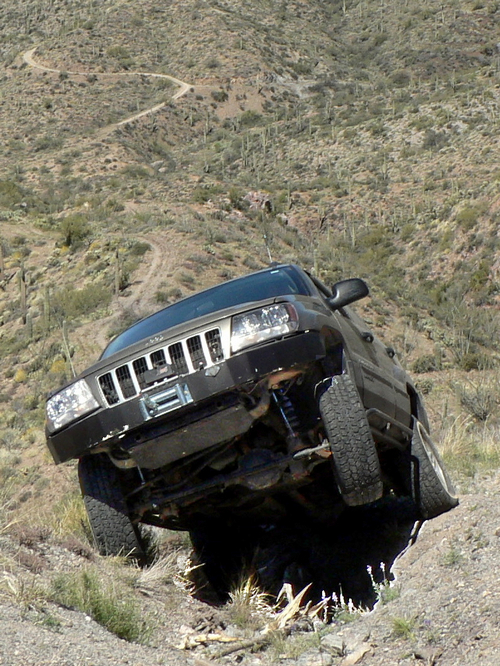 As the tires caught during the sideways slide, over she went, finally landing on the roof in the creek bed. After kicking out some of the already broken glass, and getting out of the truck, I checked my phone, and I had NO cell signal, and an almost dead battery. 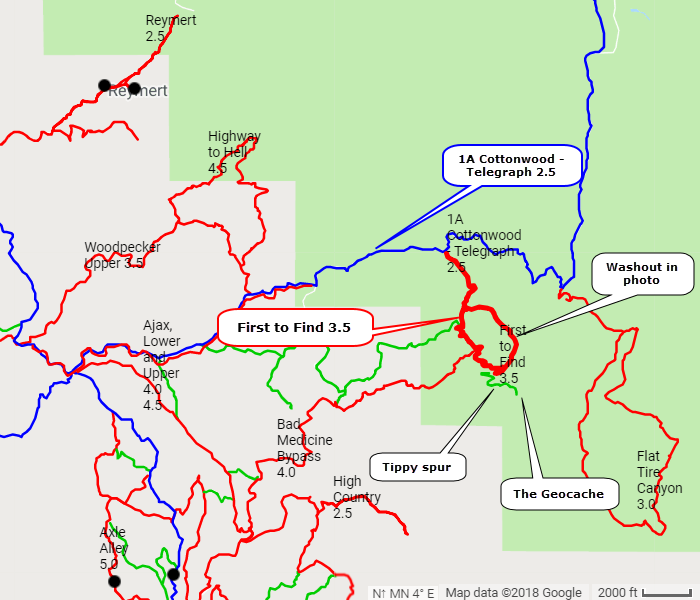 So I fished my pack out, and a few other belongings, marked a waypoint for the truck, and headed up the road to a high spot, about 1 1/2 mi, to try and get signal. Called 911, gave them my coords, and waited. After about an hour and a half, and no sign of help, I called 911 back, and stayed on the line with them. About 15-20 min later, I spotted the DPS helicopter. After they finally found a spot to land, they loaded me up and flew me into Superior, to be met by an ambulance. I did not realize how banged up or injured I was, or could have been, because of the adrenalin rush I was on. Once in superior, it was decided that it would be best if I was flown to a neurological trauma center. So, I got a second helicopter ride to Scottsdale. Fortunately, nothing was broken. Just beat up a bunch. And the let me go home after a few hours. Now we just need to figure out how to get my truck out of that canyon. *Update - June 1, 09* The truck has been recovered. It took the towing company 10 hours, 3 guys, and 3 trucks. They could not get the 24' flatbed in anywhere near, and had to upright it, and drag it out with their huge 4wd truck.